Obviously, I think the the credit union is great! 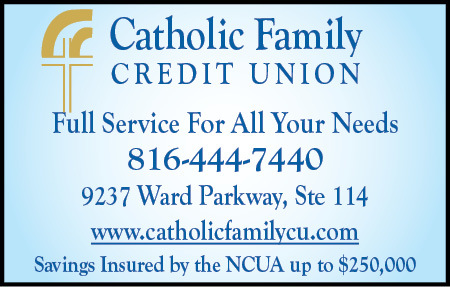 We provide basic finanacial services such as savings, checking, debit card and Direct Deposit/Direct Payment to the Catholic Communities in our area. We also have Auto, Personal and Home Equity loans! St. Elizabeth, Christ the King, Holy Trinity, Nativity, St. Agnes, St. Ann, St. Catherine, St. Louis, St. Micheal the Archangel, St. Peter, Visitation, Catholic Charities of Kansas City - St. Joseph, Avila University, Rockhurst High School or Rockhurst University. Visit us and join today to find out for yourself how much this credit union can do for you! You may also visit us at www.catholicfamilycu.com. We look forward to serving you!